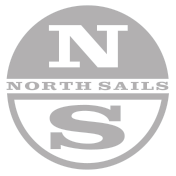 North Sails makes fast and versatile sails for the 1720 class, manufactured using the most advanced technology and highest quality materials in the industry. Our 1720 experts are available to help you get the most out of your North Sails product offering sound advice, tuning information and expertise. The M-43DL Mainsail is our our top of the range thermo molded 3DL sail manufactured from Carbon/Kevlar 680M. It offers a stronger more durable sail with greater performance and longevity. The T-6 is our running optimized mast head spinnaker. This sail rotates to windward very easily when the tackline is eased. It's easy to trim and allows you to soak very low downwind – crucial when W/L type racing. This full radial sail is manufactured in Contenders silicone finished Nylon, Dyanakote 75, to aid in hoisting and gybing. As the class is now using the “Small Spinnaker Flag” more and more at major regattas we have completely re-designed this sail for windward-leeward racing in 20 knots plus. This full radial sail is manufactured in Contenders silicone finished Nylon to aid in hoisting and gybing.